Located in the Mission Beach district of San Diego just 2.8 km from SeaWorld San Diego Awesomesauce beach house 2 provides its guests with air conditioning barbecue facilities and free WiFi. The 2-star holiday home features sea views and is 6 km from Old Town San Diego State Historic Park. The holiday home includes 4 bedrooms and a kitchen with a dishwasher and a coffee machine. A flat-screen TV with cable channels is offered. University of San Diego is 6 km from the holiday home while Downtown San Diego is 11 km from the property. 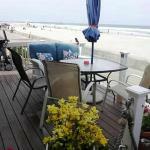 The nearest airport is San Diego International Airport 7 km from Awesomesauce beach house 2.